Analyst: So we'll build a mathematical model that explains all of the different drivers that have moved your sales over the past two to three years - price changes, advertising, discounts and promotions etc. Client: You don't just measure the advertising? Analyst: No, we have to measure pretty much everything that has had a major impact on sales, so that we can be sure we've got the advertising measures right. Client: Ah, I get it. So you have to include the weather? Analyst: [Sigh] Yes, we'll have to include the weather. If the client is a retailer, measuring the impact of the weather will come up every time, guaranteed. There's some logic as to why retailers are obsessed by it, but that doesn't mean it helps to be concentrating on how much it rained yesterday. First, a caveat. If the business sells ice cream, then of course it matters. I once modelled sales of cold sore cream (fought hard to get allocated that one) and temperature was tremendously important to sales. Let's imagine a clothes retailer though. The first thing to note about retail analysis is that far more importance is placed on what happened last week - particularly what happened last weekend - than you find in other businesses. This makes sense for stock control and making sure that your London stores haven't run out of men's blue shirts but it doesn't make sense for working out whether your advertising campaign (that has already been running for six weeks and has another three to go) is working. So you look at last weekend's figures and sees sales are down 5% year on year. The school holidays were at a slightly different time last year, but you haven't got data on those, so stick it in a footnote on the report. You have got data that says it was sunny last weekend. Everybody must have gone to the beach, or had a barbecue and that's why sales were down. Even if it's true that 100% of what happened last weekend is down to some hot weather, what have you just achieved? 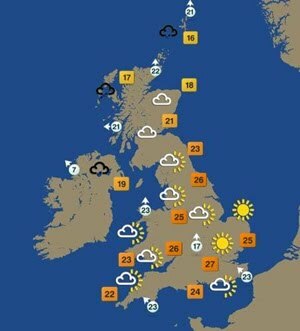 It will rain at some point - we're in the UK after all - and those people who had a barbecue last week will still need a new suit. Some sales might have been lost forever, but how does knowing that hot weather will reduce sales help you? You'll still have to open the store even if the forecast is for a scorcher. I've seen more than one retailer's weekly sales report that has a box on the template to cut and paste a screen grab from the weather forecast. That sort of reporting ends up creating an even bigger problem - one of positive reinforcement. It's easy to remember the bad weeks' sales reports that had the hot weather symbols on them and then to assume there's a strong underlying relationship to your overall sales. This weather obsession is a symptom rather than the cause. The underlying problem is concentrating far too hard on a single week's (or a single Saturday's) sales figures. Once you're in the situation of trying to explain a single day's sales, you'll fall back onto what you've got data on for that day - which leads you, inevitably, to the bloody weather again. If you're trying to work out what actually drives your business, forget last week. Forget last month even. Spend some time pulling apart at least a year's worth of weekly sales data and see what you find out. Try charting a year's worth of weekly sales against a year's worth of rainfall data. That close relationship that you thought your sales had with the weather, will vanish almost every time. On the other hand, if you do have a heavily weather impacted business - if it really would help you to know what the long range weather forecast is likely to do to your business this summer - give me a call. We econometricians can do that too, as well as measure adverting and rant about weekly sales reports. Really sorry I mentioned the weather as an example now!! Ha ha, it wasn't you - promise!